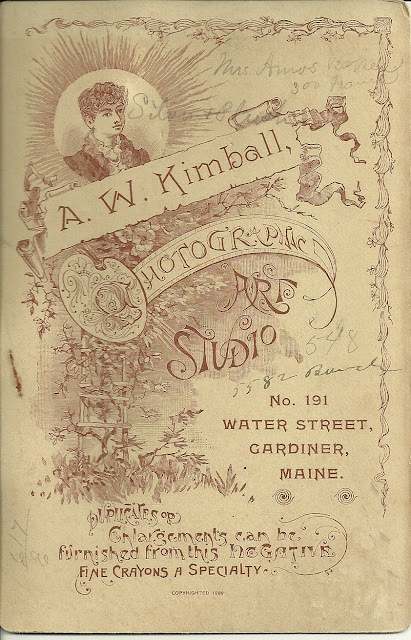 Cabinet photo taken by A. W. Kimball, Photographic Studio, No. 191 Water Street, Gardiner, Maine. There are a few handwritten notations on the reverse, one of which seems to read "Mrs. Amos Baker", plus possibly part of an address "300 Frank"? Researching online, I found in the vital records of Pittston that a Fannie Brookings, Mrs., married Capt. Amos Baker on 17 November 1878. Pittston is just across the river from Gardiner. 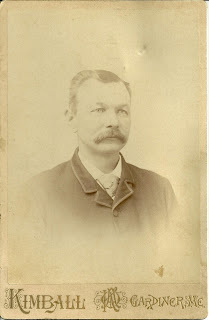 I also found reference to an Amos Baker from Hartland, Maine, who served in the Sixteenth Maine in the Civil War. But this man in this photograph remains a mystery. It's even possible that the "Mrs. Amos Baker" on the reverse of the photograph could have been the married sister of this fellow; he might not even be "Amos Baker" at all! If you have any insights into this photograph, please let me know. Thanks for stopping by!